Amsonia hubrichtii, commonly known as Arkansas blue star, Arkansas amsonia or threadleaf bluestar, grows 36 inches tall and 36 inches wide in a mounded form. This hardy perennial grows in hardiness zones 4-9 and is a versatile North American native ideal for many landscaping uses in all types of yards and gardens. Unlike many plants that truly shine only for one season, Amsonia hubrichtii offers a variety of features throughout the seasons. 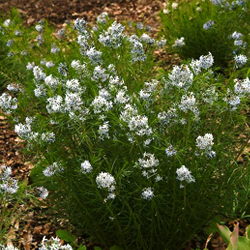 From late spring to early summer, 2-3-inch wide clusters of small, light blue, star-shaped flowers are borne above the delicately soft, ferny or lacey foliage. The alternate-arranged, narrow leaves are a marvelous bright green in spring and summer, but turn a bright yellow-golden color which is second to none among herbaceous perennials in fall. In winter, the foliage can hold its shape and support snowfall, creating a beautiful mounding effect in the winter landscape. These plants thrive in full sun to partial shade and perform best in average, moist, well-drained soil with a neutral (7.0) pH. Full sun will promote the best autumn color, but spring and summer blooms will be more prominent in a part-shade location. In a full shade location or when planted in too-rich soil, however, the plant may tend to open up and flop over, losing its full mounding traits. Though initially slow to grow and less lush and attractive when young, once established, it can tolerate drier conditions. Having no known severe insect or disease problems, other than minor occurrences of Mycosphaerella leaf spot and rust, this is a very easy to care for perennial. After the flowers have faded, cutting back the foliage to 6-8 inches will help keep the mounds full and compact. Late season growth will fill in the plant in plenty of time for its showstopping autumn color. When the plants are large, they can be divided for transplanting to add even more specimens to the landscape. Amsonia is a real asset in borders, native gardens, cottage gardens or open woodland areas. Because of this plant’s versatility, it is also ideal in rock gardens or even rain gardens in well-drained soil. It is best when planted in masses and very attractive when mixed with ornamental grasses and other plants that have attractive seed heads. It tolerates deer and attracts butterflies, making it wildlife-friendly as well. The outstanding ornamental qualities, ease of maintenance and many uses make Amsonia an invaluable perennial selection for any gardener.